To reach my place in the French Alps, the usual route from Geneva airport or even all the way from England is along the A40 motorway heading towards Chamonix-Mont Blanc. On a clear day as you approach my exit, there is the perennial snow-covered Mont Blanc chain and closer, the much lower, rather distinct almost conical-shaped mountain called La Môle. In no way, does this look like a vineyard landscape. 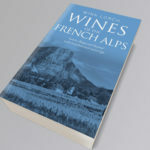 Indeed, 20 years ago when I bought my first place in this part of the Alps, my knowledge of Savoie vineyards was limited to that of the vineyards close to Chambéry and along the Isère valley running down from Albertville. It took a few visits before I discovered there was a small area of vineyards, designated as a Savoie cru, just off the motorway, at the bottom of the winding gorge that leads up to La Clusaz and Le Grand-Bornand, the two main resorts in the Aravis Mountains, my home in the Alps. 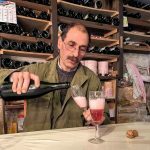 Indeed few tourists would have any idea that the vineyards of Ayze exist, yet they produce one of the world’s most unusual and delicious sparkling wines. According to Dominique Belluard, at some point before phylloxera hit in the 19th century there were 600 hectares (1500 acres) of vineyards. That number was halved by the 1920s and now there are just 25 hectares, with Domaine Belluard the only really serious, quality producer. It is Dominique’s father, Albert, who died last year, and now Dominique himself, who can be credited with saving not only this little appellation, but also its emblematic grape variety, Gringet, grown nowhere else. 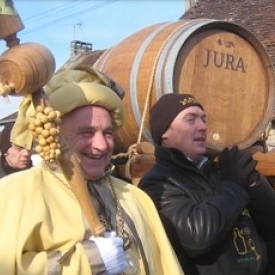 I first met Albert Belluard back in the 1990s when I ran wine and walking tours. On one hot summer’s day my small group and I arrived, by advance appointment of course, and as usual (even today) couldn’t find anyone around. Then Albert appeared from the large barn at the back, with a jolly grin on his ruddy face, the shortest of shorts, a grubby white T shirt that didn’t meet the shorts, showing a huge expanse of flesh in-between. Everyone thought he was the manual labourer, which of course he was – as well as being the owner. On that occasion, Albert first offered, still grinning, to show us his rockets. Open-mouthed, we followed him into the barn where he proudly pointed out some sizeable anti-hail rockets explaining that they were fired to try to divert hail-bearing clouds, that can be hugely damaging to vines. On my last visit earlier this summer, his son Dominique was to be found in the same barn at the back, hard at work in the workshop on a repair to the vine sprayer. 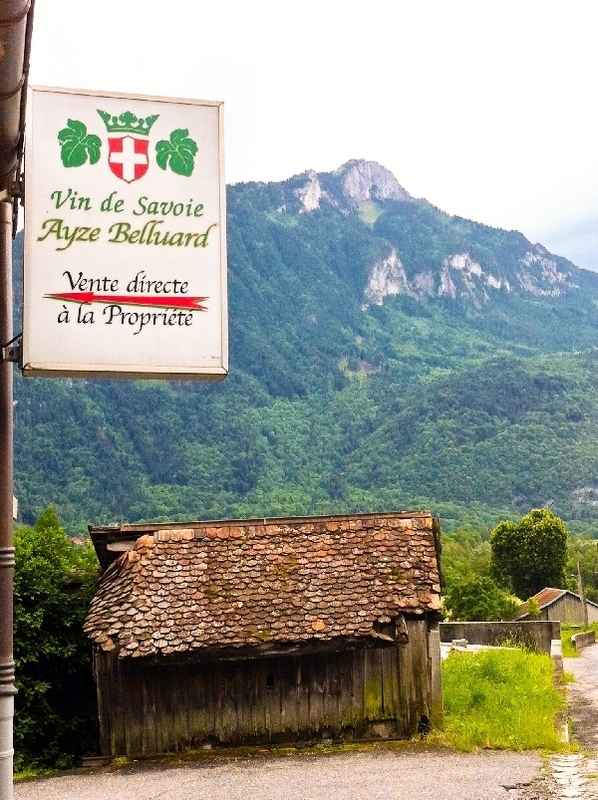 The vineyards of Ayze (sometimes spelt Ayse) are above the village of the same name, and in the nearby villages either side of the Haute Savoie town of Bonneville. All lie on the southern slopes of La Môle with a view either to Mont Blanc or the Aravis range, at an altitude up to 650m. The lower slopes are on three different soil types, of glacial origin – in the best-known vineyard plot of Le Feu, the soil is a glacial sediment of red clay with bauxite. The main grape variety that has been grown here, possibly since Roman times, is Gringet, for many years believed to be part of the Traminer family. After DNA testing in 2007 by Swiss plant biologist and specialist in Alpine varieties José Vouillamoz (author with Jancis Robinson and Julia Harding of the exciting new and massive book, Grapes, available in October), it turns out to be an indigenous variety. Domaine Belluard has around ten hectares of Gringet and just half a hectare each of Altesse (for Roussette de Savoie) and Mondeuse for reds. Some of Dominique’s vineyards are extremely steep, especially Le Feu, and in recent years he has sold various plots to make his estate more manageable. The steepness is the main reason that it has taken over ten years for Dominique to convert to organic and then biodynamic viticulture, something that requires hard manual labour. 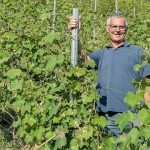 But he is absolutely dedicated and passionate about biodynamics, and any chemical intervention that he has been forced to use, simply to save the crop, has always been done in the most limited way. Fundamentally, Dominique reminds me of an intelligent mountain man, such as I have had the privilege to meet, usually working as expert summer and/or winter guides for climbers or extreme skiers. No surprise then that in his limited leisure time, he heads for those mountains, usually with a paraglider on his back. Dominique is part of the ‘natural wine’ scene, but remains quiet and rational about it. Of course he uses SO2 in most cuvées, mainly at harvest to protect the grapes before pressing. Yet in all wine regions in the world I’ve visited, this is the first place I ever saw, or even heard of, concrete eggs used for fermentation. He installed his first one, to test, way back in 2004, at a time when some Swiss and other producers were also trialling them. No-one expects to find this sort of innovation in Savoie! More than a dozen eggs can now been seen in the cave here, and Dominique reminds me on this last visit, that eggs are the purest form, viz. the Golden Egg – no, I didn’t know much about this either, but check out this piece about concrete egg manufacturer Nomblot’s eggs used by South Africa biodynamic wine producers. Concrete is good for temperature regulation as well as some breathability and these are some of the reasons why Dominique prefers this material over the stainless steel he still has. But, the most important aspect of the egg shape is the Brownian motion which keeps the lees in suspension, adding to wine flavour later. Dominique is also experimenting with clay amphora for the small amount of Mondeuse he makes, something in such short supply that I missed out on it at the Real Wine Fair in London, and again on our visit this time. Any tasting with Albert, Dominique’s dad, soon developed into a riotous – in the best possible way – event. In fact, something I never did, was to arrange a fondue evening that the family used to offer in their cellars for groups. Sparkling Ayze used in and with cheese fondue is still popular in local restaurants. The Belluard tasting room remains just the same, dark and with some amusing mementoes on the wall, but the atmosphere, like the wines, is a touch more serious than before. Whilst we taste, this time in June, at a crucial time for work in the vineyards, Dominique takes a call from a casual worker who is not going to make it to work the following day. Dominique struggles to find a replacement and fumes about it – half his turnover, he explains goes on the labour force, and constantly they let him down. This is another reason he has cut down the vineyard area. The Belluards only started making still wine in the late 1980s and when Dominique fully took over the quantity increased gradually so that now, in most years, he makes 35-40% still wines and would like to increase this to 50%. For now, he has to satisfy his local customers, both private and restaurants, who expect sparkling wines to be available. Exports are dominated by the still wines, and have now reached 10% of his sales, which is high for Savoie. Over the years, Belluard’s classic sparkling Ayse has got better and better, and I love sharing it with friends we invite to the chalet. Although Brut it has a lovely aromatic softness, and typically, many who confess to not being Champagne lovers (possibly because they mainly drink cheap Champagne) simply love this wine. In recent years, Dominique has released a special sparkling Brut Zero cuvée named Mont Blanc from selected parcels of Gringet grown on a stony limestone soil. We tasted the 2008 and it was stunning, steely with a zest of lemon and really long. Having purchased some, we drank the first bottle with Sue Style and her husband in early August and we were all blown away by the lemon crystalline character of this stunning, steely sparkling wine. The only non-Gringet white that Dominique makes is from his half hectare of Altesse planted on a marl soil in 1998, organic from the start. Named Grandes Jorasses, after one of the highest and most distinctive mountains in the Mont Blanc range, the last time I had drunk a glass was rather incongruously over a late breakfast in California with Cory Cartwright, whose company Séléction Massale imports Belluard’s wines into the USA. Tasting the 2010 on our visit, the wine seemed simple at first, but opened up to show an exotic, flowery character (Dominique likens Altesse to Gewürztraminer something I’ve not considered before), and pure almost opulent fruit on the palate. The wine spends eight months in the concrete eggs and like all good Altesse wines needs a few years to be at its best. Gringet is, according to Dominique, like Riesling. Certainly the flagship Le Feu 2010, made half in stainless steel and half in the eggs, is currently much too young, but we tasted from a bottle opened three hours previously, and it did show that same lovely elegant acidity as top Rieslings do. This 2010 was from a very late harvest starting 10th October, and Dominique prefers it to the richer 2009. It is a wine with tremendous potential and we bought some to forget about for a while in our cellar. Dominique was out of stock of the standard Gringet cuvée Les Alpes 2010, and instead served us the 100% Pur Jus, his sulphur-free cuvée to taste. It comes from 50-year old vines, again on that stony limestone, and has no skin contact. It was indeed pure fruit on the nose, but the palate revealed that hardness that I find so often with sulphur-free wines. That would disappear in time, maintains Dominique. I hope he keeps putting that small dose of SO2 in most of his wines. To finish, Dominique searched out an older bottle and returned with a 2005 Les Alpes that was full of bubbles though supposed to be still! This was due to the bad weather, the low pressure weather system that day, he explained. One of the early wines to be partly fermented in the concrete eggs. the nose was spicy and exotic, the palate light, but showing age. The wine was fascinating as was the whole visit – Dominique is a fine ambassador for mountain wines and for my region in the Alps.